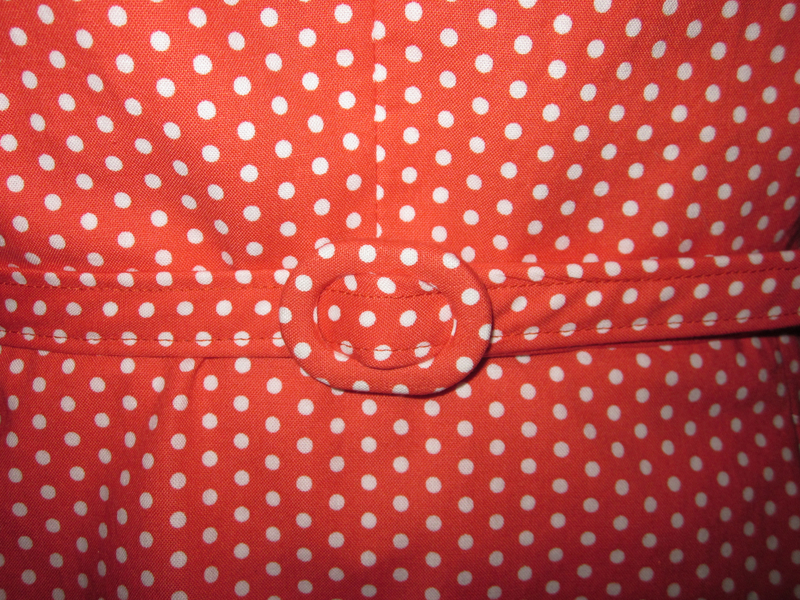 The polka dot top is almost done. I was going to post progress on Sunday, but I only had the hand sewing left to do, so I wanted to wait until it was all done to do a full writeup. The handsewing is taking a while. Since I’ve underlined everything, I’m stitching the sleeve facings, neck facing and hem with the catchstitch. This is the first time I’ve done a catchstitch. Boy, does that stitch eat up the thread! Every time I breathe, I’m rethreading my needle. I like the way it looks, however. I also have some snaps to stitch. I’ll be sewing them on with a buttonhole stitch. I don’t remember where I first saw a picture of a snap done with this stitch rather than a whipstitch, but it looked so professional. I knew I had to try it. Look, I made a matching belt! I'm going to be doing a lot more of these. I may even have to lay in the supplies to put in the eyelets properly. How cool would that be? Once I’m done with the coral outfit, I’ll finally be moving on to the Fall Palette Challenge. I’ve purchased the fabric and supplies for a wearable muslin of my next project. I’m as excited about the prospect of the wearable muslin as I am the actual project itself. Details on that soon as well.